I have extracted important clauses from the relevant HPCSA booklets which need to be noted prior to my comments on the desirability or otherwise, of Private Hospitals wanting to employ doctors. These may be purchased at market related prices and in an arms- length transaction only. HCP may not accept, nor hospitals impose, any conditions on Practitioners purchasing such interests, if they are in conflict with the Ethical rules. Financial or other rewards or returns cannot be based upon admissions or specific targets of servicing patients. Peer review procedures must be put in place to prevent over-servicing. HCPs may not participate in advertising or promotion of the institution. HCPs may not advocate preferential use of the institution. The purchase agreement is submitted and approved by the HPCSA. HCPs must submit an annual report to the HPCSA on the number of patients referred to such institution as well as the number referred to other institutions. HCPs may not accept rentals in a healthcare establishment which are not market related. HCPs may not accept rentals from Healthcare establishments under a financial arrangement which is not available to similarly qualified HCPs. HCP may not accept commissions or any financial gain, or other valuable consideration in return for purchase, sale or supply of goods used by the HCP in his practice. HCP may not offer any financial gain or other valuable consideration to any person for referring patients to him or her. Any service which is not rendered including appointments not kept. HCP cannot share fees with anyone who has not taken a commensurate part in delivery of the service being charged for. Charges levied for any services offered to an HCP related to their income from patients, needs to be agreed up front and NOT BASED UPON A % OF TURNOVER, NOR ON A COMMISSION OR ON INCOME. in return for which a fee is charged which is linked to a percentage of the HCPs turnover or a percentage of the debts recovered. HCPs may not enter into a contract on the understanding that the he generates a particular amount of work, or turnover target for the establishment despite the health facility equipping a theatre etc. for a specific practitioner to his specifications. Corporates must be precluded from exercising any coercion which would motivate HCPs to violate the Ethical rules. Any person, natural or juristic, NOT REGISTERED to THE Health Professions ACT, may not share directly or indirectly in the profits or income of a Professional Practice, and is not permitted. Paying or providing a HCP with some or other benefit thereby allowing him to share directly or indirectly in the income or profits of the Professional practice. ALL EMPLYING INSTITUTIONS MUST BE ACCREDITED BY THE HPCSA. It is an offense both to offer or accept incentives either financially or in kind, with no evidence based or scientific basis or cost- effective considerations to the patient. Financial incentives can be offered to promote quality and cost- effective care, based upon performance of best practice and ethical behaviour, but not to withhold medically necessary care, nor to over or under service. HCPs may not permit financial incentives to influence their judgement of appropriate therapeutic alternatives, nor deny their patients access to appropriate services based on financial inducements. HPCs shall not provide services which are not indicated, scientifically validated, or are harmful, ineffective or inappropriate through Evidence Based Medicine (EBM), nor shall they refer to another HCP for such a service. Over- use of equipment for procedures and tests which are not indicated, scientific or based on EBM is viewed in a serous light by the HPCSA, and is prohibited. Fees charged must be market related and not designed to profiteer. These should be developed by HCP groupings based upon scientific criteria and not dictated or influenced by MCOs, HMOs etc. based only on cost saving measures. Formularies and restrictive lists must be based upon EBM and best practice principles BUT may take into account cost effectiveness. Prepayment for services rendered via capitation models (risk sharing) is now condoned by the HPCSA provided that the HCP and the patient are fully informed of the risk they assume, and adequate mechanisms or in place to manage the risk. Underservicing must be prevented and any withholds audited to ensure that these are appropriate, reasonable and in keeping with the contractual terms and the ethical rules, by the use of independent utilisation reviews, practice profiling and peer review. All Managed Care Organization (MCO) contracts must be based upon ethical, legal and clinically and scientifically proven facts and EBM. HCPs may not enter into contracts may which affect their clinical judgement or independence. Credentialing and accreditation of HCPs is acceptable provided that it is based upon transparent criteria of professional competency, professional qualification and experience. The rules are silent on whether this should be based upon minimum requirements for the facility from which the HCP practices. Networks may not be exclusive, and must be open to all willing and suitably qualified providers if they meet the criteria of professional qualifications, Competence and Quality of care. There needs to be compelling reasons why a HCP is denied inclusion. Freedom of choice maximises competition; however restriction of choice may be necessary in the interests of access to healthcare, provided that quality of care is not compromised. HPCSA mentions that it is however acceptable for a patient to pay extra to consult a provider of their choice. HCPs in Group Practices (except for radiologists and Pathologists) may practice only within the scope of the profession in respect of which he is registered under the HP Act. This suggests that group practices may not comprise HCPs registered in different Medical specialities. HCPs may not advertise nor endorse, preferentially use or encourage in a manner, the use of a HCP, facility or medication or device, which unfairly promotes that modality for financial or other valuable consideration. An HCP may only refer a client to an establishment where he or a close family member or business associate has a financial interest if this interest has been declared to the HPCSA and approved by the Council AND that such an interest has been disclosed to the patient prior to the referral. HCPs may not consult with one patient in more than one capacity. Special mention is made of High technology equipment, which may lend itself to inappropriate use by individuals who are not properly qualified OR through over servicing by qualified persons. HCPs may only use technical equipment if it forms an INTEGRAL part of the scope of practice and have received appropriate training in the use and management thereof (NB ultrasound examinations). Access to confidential patient information by a 3rd party requires the informed consent of the patient or their guardian, executor of their estate or curator. Practitioners must ensure that this information remains confidential and must protect against situations where payment for their services is withheld on the basis of nondisclosure to an employer or other third party. The HPC remains accountable at all times to the patient for reasonable skill and care. Should the advice of an HCP be in conflict with the patient’s medical scheme, or MCO, or employer the HCP shall provide the patient with a written explanation to enable the patient to make an informed choice as to the treatment path they desire. HCP must inform the patient of medically appropriate treatment options regardless of their cost, or extent of their medical aid coverage. For years certain Private hospitals have been employing doctors to run their EMUs with permissions obtained under a previous dispensation. 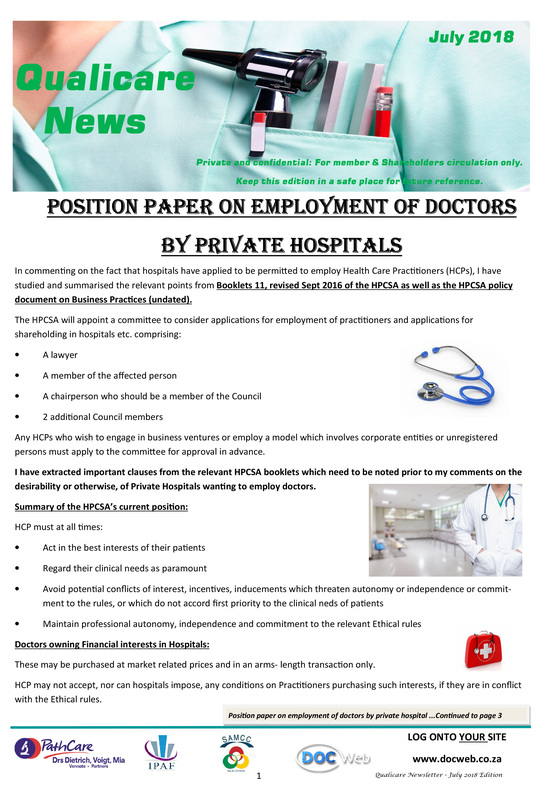 Employment of HCPs is dealt with in Booklet 2 of the HPCSA’s Ethical rules and in the light of the resumed push to employ doctors by private hospitals, is need of a more specific and definitive rewrite. Council has in the interim measure, looked at the concept of private hospitals employing HCPs, on a case by case basis, with a specific bias toward addressing patient needs, and in NPOs, NGOs and charities, but not to fulfil any private profit motives. The Unit, including it’s nonmedical staff and support staff is rented to a physician who may or may not have ATLS etc. The HCP pays the hospital a rental which should be market related, and he runs the unit and he is then entitled to employ other locums or take in associates, partners or locums, and runs this as his practice, keeping all of the income generated from seeing patients, and which is paid into his practice bank account and from which he pays the employed doctors a fixed salary. The Hospital runs the unit as part of the hospital and employs doctors, nurses and support staff to work in the unit at a salary. All income earned from treatment of patients accrues to the hospitals dedicated bank account. This method appears to be in conflict with the rule on Sharing of fees /dichotomy. Apparently, further private hospitals have applied for, or already has, HCPs employed in its ICUs, A and E units and Maternity wards and have to produce an annual report highlighting proof of advantages to the patients care and the rules of governance, for the HPCSA. More hospital chains now want to follow suit. Many regular FPs decided not to perform calls outside of normal hours and this strengthened an already keen market for hospitals to open EMUs offering initially only offering after hours services. These rapidly expanded from After Hours units open from 18hr00 to 07hr00 to 24 hours A and E hour walk in centres which, despite their name, treat anything from coughs, colds and flu, to life threatening conditions. At the outset, any HCP with an MBChB could offer his services to work in an AH Unit, but slowly , the hospitals have, correctly, insisted that the minimum requirement is an ATLS, ACLS and APLS or DIPEC qualifications as a minimum entry criteria for doctors to work in EMUs. In compliance with the Ethical rules around supersession, the EMU doctors were originally obliged to call the patient’s house doctor/FP and only offer assistance if it was a true emergency or if the FP did not want to come out. Many FPs were vehement in their insistence at being called for their patients but could not guarantee their arrival times often leaving patients waiting many hours. So patients voted with their feet, and insisted on being seen, or going to another unit which was more patient orientated. IPAs in the Western Cape like CPC/Qualicare, wrote protocols and policies in line with the HPCSA Ethical rules and dedicated to preserving the doctor patient relationship by first calling in the patient’s family practitioner or referring patients back to their chosen FP with a summary of what was found. Few family practitioners would bother to come to see their patients when phoned as patients become restless and aggressive, and the EMU doctors often did not complete the discharge letter back to the patient’s own GP. These new EMUs were expensive to run, and the only manner in which the hospitals could justify their cost was to show a return on investment. Pressure was exercised on the autonomy of the doctors running the units, to accept minimum admission targets, and in the Western Cape a number of the doctors who ran these units with a high degree of success honesty and patient satisfaction were dismissed when they rejected these intrusions into their autonomy. Ambulance drivers and controllers were also incentivised to bring patients to specific hospitals by cash incentives, or luxurious stand down lounges with food and TV facilities, or both. Patients too got the hang of it and began utilising this easy admission policy to circumvent their restrictions on a “Hospital plan”. Once the patient was admitted, there was no restriction on utilisation of otherwise limited benefits of pathology and radiology. Specialists when on call, and if the case was not life threatening, they would instruct EMUs HCPs to admit patients despite being “on call”, as it was not convenient to come out. This resulted in not only a hospital ward fee overnight, but also an unnecessary consultation the next day, during a quick ”discharge” ward round. Worse still, some HCPs sent their patients in for an emergency admission to circumvent the restrictions of their hospital plans, and permit MRIs, procedures etc, which normally would have been for the patients pocket. Many on call showed reticence to come in when called, and demanded (and many still do) an “on call fee” for being available. This became the source of disagreement between HCPs who had rooms in the hospitals and the private hospitals, forgetting that their heavily subsidized rooms from the same hospital, were seen as a “given”, and could not be factored into being available after hours at no fee. It is well known that private hospitals have offered discounted market rentals up to 80%, to specialist HCPs, with the per meter rate indirectly linked to the “bums on beds” that were admitted into the hospital. EMUs had thus become a “win” for the hospitals, and patients, and a “lose” centre for medical funders. They therefore urgently responded by writing pre-admission protocols EMUs, with a rule that if no intervention followed an EMU admission or if the intervention did not match the episode of care, or was not a PMB, the entire bill was rejected and became patient liable. This still did not curtail patient driven frivolous overutilization of the EMUs as a method of circumventing the waiting time in the FPs waiting room with EMUs remaining open for 24 hours a day with little or no triage systems in place. With time tighter triage followed together with co-payments for non-urgent and non PMB cases. Ability to limit attending doctors to those with higher qualifications e.g. ATLS etc. Potential abuse of the medical profession with dual loyalties loss of autonomy and profit motives. Ethical dilemma by hospital pressuring doctors in the EMUs to improve the hospitals ROI. Offers of turn over related profits, kickbacks from admissions and use of pathology, radiology, and expensive other equipment. Good exposure to first world facilities and first world specialists for the EMU doctors Enhanced levels of skills for EMU doctors Ability for young doctors to enter a readymade system, and earn money soon after qualification, instead of emigrating Opportunity for A and E units to be accredited and run along tighter Ethical lines with removal of perverse business interests affecting quality of care. Full commercialisation of Family Practice, with denuding of FPs from already served and underserved areas. Loss of focus on Primary Preventative health and move to interventional and curative medicine. Loss of Doctor autonomy and eroding of Medical Ethics. When considering all the above including the strengths, weaknesses, opportunities and threats, it’s a considered feeling that private hospitals should not be permitted to employ medical practitioners.